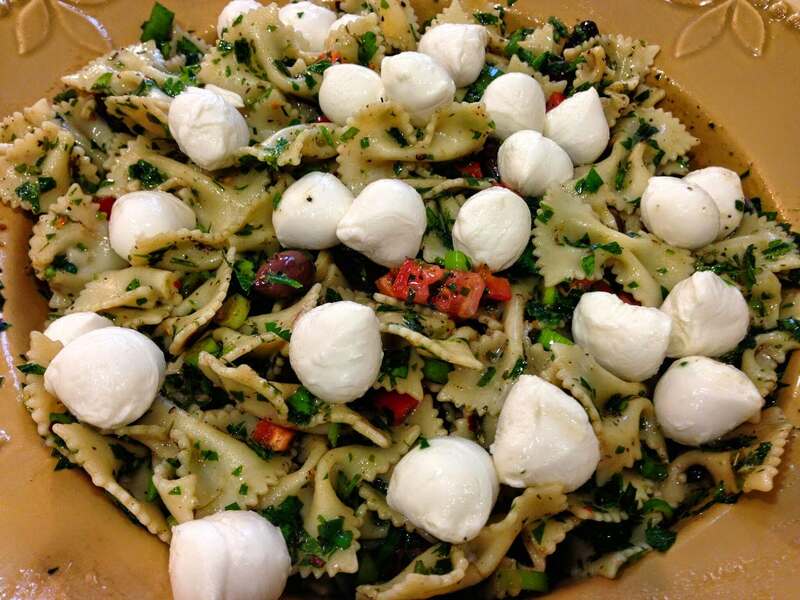 This is a mayonnaise-free pasta salad. The traditional mayo dressing is replaced with a tangy vinegar-herb dressing with a little kick, thanks to the crushed red pepper flakes. Bring a large pot of water to a boil over high heat. Season with 1 tablespoon salt, add farfalle pasta, cook for 8 minutes, and drain. In a large bowl, toss together pasta, tomato, flat-leaf parsley, green onions, basil, red bell pepper, and kalamata olives. Add oregano, mint, crushed red pepper flakes, thyme, remaining 1 teaspoon salt, black pepper, balsamic vinegar, white balsamic vinegar, and extra-virgin olive oil, and toss until everything is well coated. Top pasta with mozzarella balls and serve immediately, or cover and refrigerate to enjoy for 2 or 3 days. You can replace the mozzarella cheese with 4 ounces of crumbled goat cheese or [1/2] cup grated Parmesan cheese if you like.